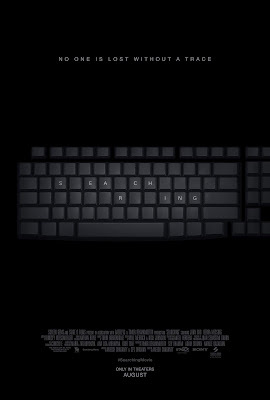 Searching will be screening on Thursday, August 23rd, at 7pm at MJR Troy, and twenty-five of my lucky readers will EACH receive an admit-two pass for the film! David Kim becomes desperate when his 16-year-old daughter Margot disappears and an immediate police investigation leads nowhere. He soon uses Margot's laptop to contact her friends and look at photos and videos for clues to her whereabouts. The movie stars John Cho and Debra Messing, and is rated PG-13. Enter to win one admit-two screening pass below. Giveaway will end on Wednesday, August 15th, at 11:59pm EST, and winners will be notified via email the next day.